Postcardese: A postcard from "G and G"
A postcard from "G and G"
Two years ago my grandparents sent me a postcard. On the front, in Bamforth “COLOR GLOSS”, is a photograph of Morecambe: the seaside resort where they lived from 1948 until my grandmother died in 2012. The card is written by Grandpa yet signed "G and G". Since Granny passed away the card’s essence rests in the moment it was written, in how my grandparents would have been together when Grandpa put pen to card. More than the written message, more than the image on the front, the card is special because it was sent by them to me: this card was with us, it appears to say, it is now with you, we once held it, today you do. Before it took on this aura, the postcard was primarily a puzzle. A joyful, impish puzzle. When I first picked it up, everything seemed in order. Card No. 49 “Morecambe from the Air”, signed by my grandparents who lived there. But although I have been to the town countless times, the Morecambe on the card’s front is unfamiliar to me. Its main landmarks no longer exist. At the top is the Central Pier, burnt down more than twenty years ago. In the foreground is the enormous Swimming Stadium, demolished in the 1970s. "Hi Guy! Thought you might like this card. I took the photo in the early 1970s. It was good to see you last week. Keep in touch. G and G."
Over Christmas I took the card back to Morecambe with my dad, on a visit to see Grandpa. We sat in Grandpa's front room, Grandpa, Dad and I, and used the card to reminisce. Over cups of tea, he explained how and why he took the photograph for Bamforth. To understand how he came to take the photo we needed to go back forty years. To understand the significance of the photo to him, we went back further - to the 1930s. Grandpa first visited Morecambe when he was sixteen years old, on holiday with a friend. Training to be a musician, he was keen to go the ballroom on the pier. He still remembers stepping into the ballroom for the first time, being awestruck by the sunshine coming through its windows: "It was like going onboard an ocean liner." While his friend took to the floor with different Morecambe girls, Grandpa experienced a kind of epiphany. He sat by the side of the dancefloor, lost in the splendour of the ballroom, lost in the music of ‘Richard Valerie and his Broadcast Band’. Gathering his senses together, he took a long look at Valerie and thought, that’s it, that’s what I want to do. When he returned home, to Colne in East Lancashire, he took up the saxophone. That dance hall favourite. In 1948, having finished his training and having spent several years touring theatres in the North West, he got the call he had dreamt of. He was to become the next bandleader at the Central Pier. Now married, he and Granny moved to Morecambe permanently. And for the next 17 years ‘Alvin Atkins and his band’ (pictured below) entertained dancers at the Marine Ballroom, above the water of Morecambe Bay. 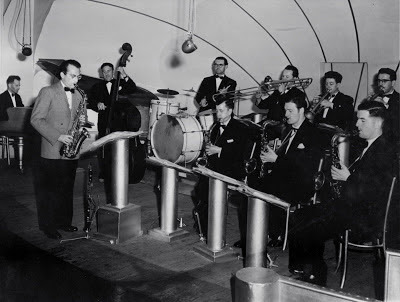 When rock 'n’ roll surfaced with “the three-chord bands”, demand for ballroom dancing faded. Grandpa and his band had to leave the pier. He took up a weekly residence at the Midland Hotel, the building in the bottom right-hand corner of the postcard. To supplement his income from this, and that earned from teaching music, he opened a photography studio. He began a second career as a photographer, taking wedding photos and family portraits. It was at his studio that a representative from Bamforth called to see if he would be interested in taking aerial photos for their postcards. The rep explained how it made sense for a local photographer to take the shots; the tide needed to be in, and the weather fair, so it was too much of a risk for a photographer to travel to Morecambe in case conditions changed. Excited by the challenge, Grandpa agreed. One Sunday, when the weather seemed settled, he and Granny drove out to Blackpool airport where he arranged to fly over Morecambe with an amateur pilot. Hands shaking, the lens stuck out of a flap in the door of the plane, Grandpa successfully took the photos from the sky above Morecambe. And so began a sequence of events that would finish with him selling the cards for which he had taken the images. After the flight, he sent the ‘transparency film’ to a lab in Brighouse, West Yorkshire. A few days later they sent him a box of slides made from the film. Next, Granny and him drove the box to Bamforth’s offices in Holmfirth. And within a few weeks, after Bamforth had sent the images to Holland for printing, Grandpa had bought a supply of the postcards. From then on, outside his studio, he kept a rack of postcards for sale which included a few of his own. 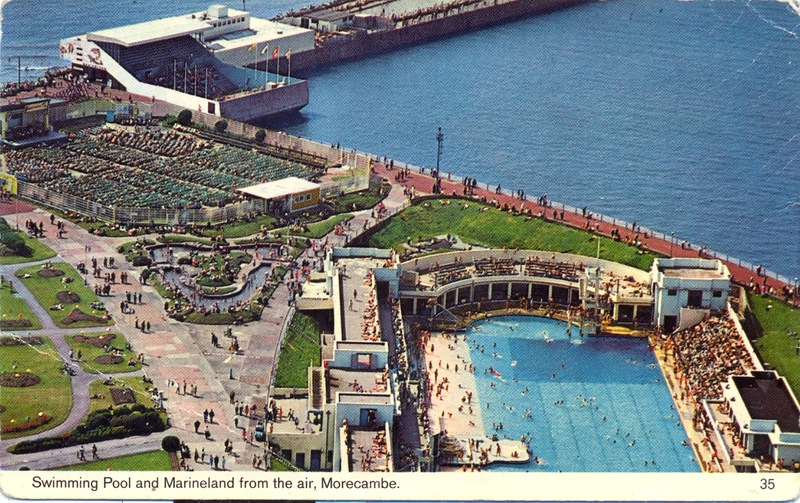 This second card shows a reverse angle of Morecambe, taken after the plane had circled the seafront. Brilliantly, as we passed the cards back and forth, Grandpa delighted in a new thought. Noticing how much bigger the Swimming Stadium was in the second card, he laughed at how it looks like the plane must have taken a dive, flown lower on its return to Blackpool. But this was not the case. Bamforth must have cropped the image. In fact, they cropped both cards’ images as the slides he and Granny took to Holmfirth were not in postcard dimensions; they were all two-and-a-quarter inch square. That card No. 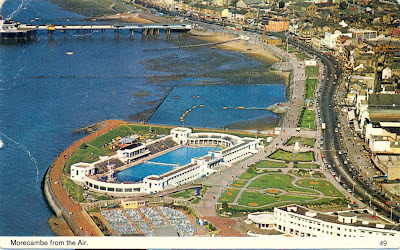 49 included the pier and the Midland Hotel, both so important to Grandpa’s musical career, was in part good fortune. As ever, the afternoon with Grandpa passed quickly. Always the entertainer, he is a skilful storyteller with an ear for what makes a good tale. Granny, the pilot, the Bamforth rep, the film technicians in Brighouse, the staff at Bamforth HQ, the printers in Holland, and the wholesalers from whom Grandpa had bought his stock. 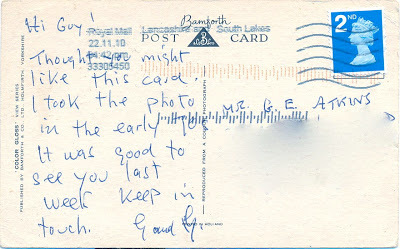 The card from “G and G” is now back in my collection, richer for Grandpa's memories. I only wish I had taken the time to ask the other "G" for more of her stories, while I had the chance. The full version of this article is published in February's Picture Postcard Monthly. A lovely post. I love the connection from the postcard to your heritage. Wonderful! I thoroughly enjoyed the story behind this wonderful postcard. I LOVED every minute spent reading about your dear Grandfather, the love he had for music and photography, the great beauty of his relationship to your grandmother, and his obvious care and love for you. ((hugs)) You are a natural born writer. Lovely story! 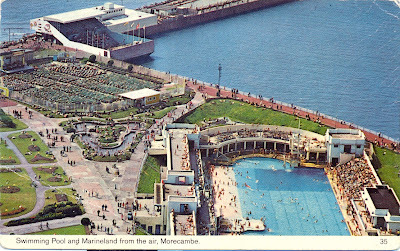 I've never been to Morecambe,now I want to go and see it for myself. I love the story behind the postcard! I wish I had lots of fond memories with my grandpa but he died when I was very young. Have a great weekend.